THERE’S GOING TO be no break in the cold weather over the coming days with sleet and snow forecast later this week. Today will be mostly cloudy and mainly dry, with patches of mist and drizzle near the west and north coasts. Temperatures will range between eight and 10 degrees with light southwest breezes. Tonight’s conditions will remain relatively dry with temperatures dropping to as low as one degree. Met Éireann says a touch of grass frost is to be expected. Tomorrow will continue with cloudy conditions with a new bright or sunny spells forecast. It will be slightly warmer than today with temperatures of between nine and 11 degrees. Conditions will worsen on Wednesday with rain spreading eastwards across the country throughout the day. The wet weather will persist for the rest of the day and will become heavy during the night. Despite the deteriorating conditions, temperatures will rise to between 12 and 13 degrees. Thursday will be bitterly cold with fresh, gusty north to northwest breezes and afternoon temperatures of just three to six degrees. While there’ll be sunny spells during the day, rain, sleet and snow is forecast. 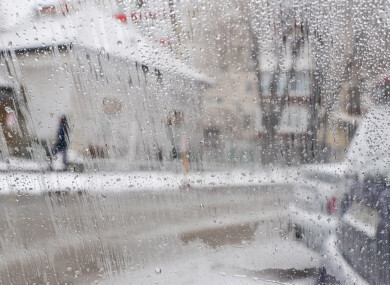 Met Éireann says the likelihood of snow will increase in the evening and night as temperatures drop to -2 degrees. Frost and icy patches are expected. The rain, sleet and snow will continue throughout Friday, with sharp and severe frost developing with icy patches during the night. Email “It's going to be a cold and frosty week with snow and sleet forecast ”. Feedback on “It's going to be a cold and frosty week with snow and sleet forecast ”.